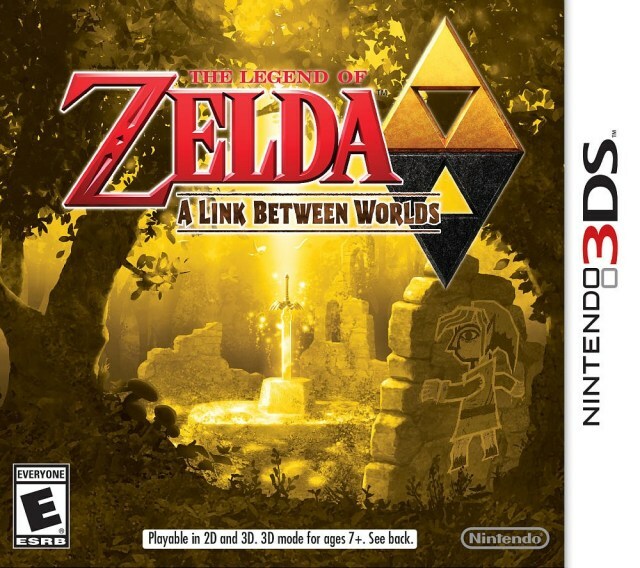 I know that Zelda and risk don’t normally go hand in hand with one another, but that’s the best way to describe what Nintendo has done with The Legend of Zelda: A Link Between Worlds. It’s a follow-up to 1992’s A Link to the Past on the SNES, which is a title often hailed as being one of the best in the franchise. To continue that legacy would either please long time fans, or completely alienate them. 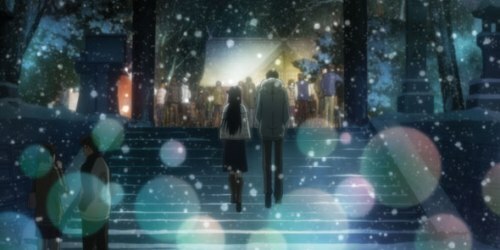 And regardless of how good it is, it will never measure up to the fond memories had with the original source material. So even when you’ve won, you’ve still lost. If you weren’t around during the SNES days, A Link to the Past introduced a number of items and concepts that became series mainstays and would influence games such as Link’s Awakening and Ocarina of Time. 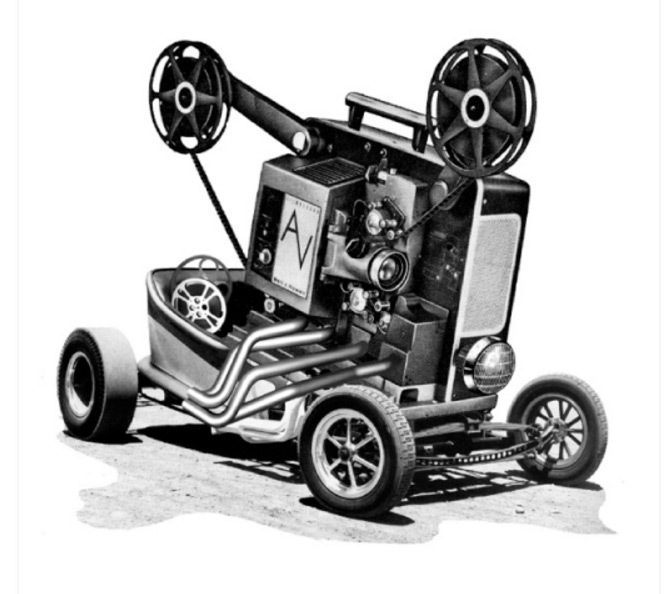 It had light and dark worlds that required Link to perform actions in one in order to affect something in another. 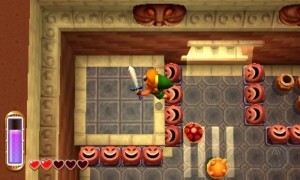 It was also the debut for a number of common pieces of gear, such as the hookshot and the Master Sword. But most of all, it was a masterfully designed piece of work that returned to the top down viewpoint of the original (as opposed to Adventure of Link‘s side-scrolling affair) and made the most of the idea that the engine would allow. In other words, it was a pretty big deal. So no, A Link Between Worlds isn’t going to revolutionize action/adventure games, nor will it be regarded as genre-defining. However, it gets as close to perfection as they could have gotten given the premise, and it succeeds in being a damn good 3DS game, if not one of the best of the year. 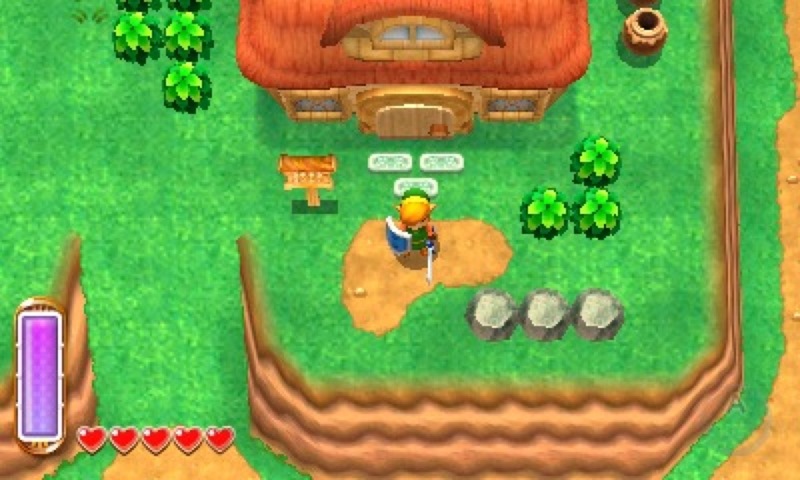 Even though the game is set sometime after A Link to the Past, A Link’s Awakening, AND the Oracle of Ages/Seasons games, it does return to the former’s version of Hyrule. So even though the Link and Zelda of this world are both a brand new incarnation, the map is quite similar to what you may remember from the SNES original. Similar enough, at least, to identify roughly where things are located, though still tweaked to the point where there are plenty of secrets and surprises yet in store. This time around, Link serves as a blacksmith’s apprentice and during a routine sword delivery discovers that something is amiss at the sanctuary. He arrives in time to encounter a new villain, Yuga, in his attempt to imprison the descendants of the Seven Sages within paintings. During a skirmish with Yuga, Link is himself transformed into a painting, but discovers that a bracelet given to him by a mysterious merchant allows him to alternate between being himself and a scribble on the wall. This also grants him access to a parallel world known as Lorule (get it?) where that world’s princess, Hilda, guides Link on his quest to free the Seven Sages. What makes the premise so enjoyable is how much of a story it’s able to tell without heaping loads of exposition on you. As much as I enjoyed Skyward Sword, it took a very long time to get things underway, whereas A Link Between Worlds will have you dungeon crawling within minutes. There are also quite a number of plot developments that I legitimately did not forecast, which lead to further enjoyment of a story I thought for sure would lean too heavily on its predecessor. This isn’t to say the game doesn’t try hard to invoke nostalgia by way of sights and sounds. Right from the get go, you’ll notice the music is a throwback to the SNES original. Everything from the title screen, to the overworld, to some of the dungeon themes will be instantly recognizable to fans of its predecessor. 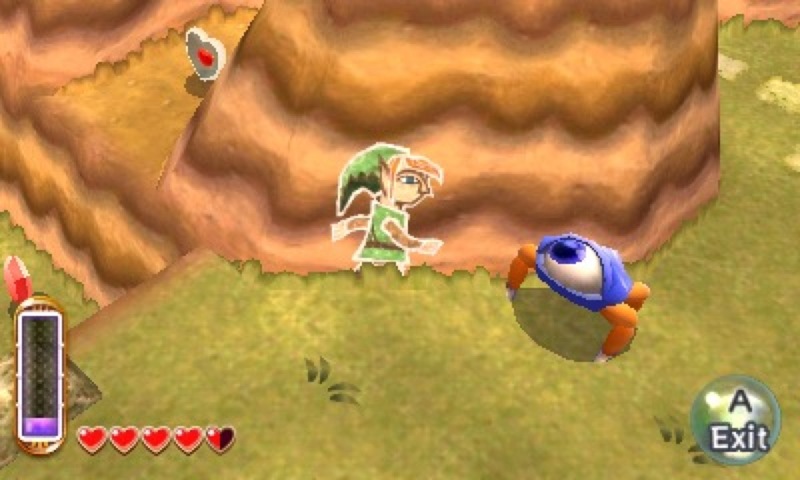 The visuals have gotten a facelift since that game, though despite being rendered 3D models, the action is still viewed from a top down perspective. It’s also one of the few games to make creative use of the system’s 3D technology as it really helps with depth perception when dealing with dungeons that span multiple floors. The characters themselves have something of a disproportionate look about them, though it’s still befitting of the spirit of the original game. Not everyone will be a fan of 90’s Link I’m sure, but to each their own. A Link Between Worlds does things quite a bit differently than the two DS entries. For one, you are not restricted to the touchscreen for all of your actions, which as much as I enjoyed those two games, is a huge improvement. 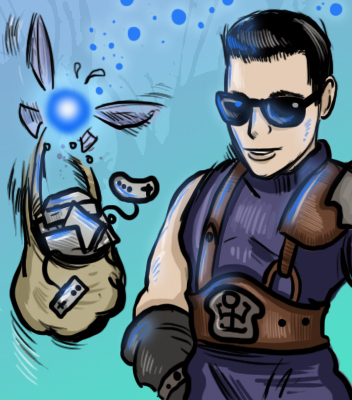 You can move with the analog stick, attack with B, and perform all of your context sensitive actions with the A button. As soon as you receive a shield and pegasus boots, you can block with R and dash with L respectively. At first, you can only map additional items to your Y button, but eventually you will receive an item that will let you use X as well. The map of your current area will always be displayed on the bottom screen, though there is a tab for your gear that can be accessed at any time, plus you’ll eventually learn how to quick swap items without having to use this menu at all. It’s all very intuitive, leaving you to freely explore dungeons and slay monsters without giving a second thought to the interface. One surprising addition that I thought was rather odd are the weather vanes. These act as both a landmark to teleport to when you gain the bell item as well as save points. What this means is that the only way that I could find to save the game was to use the weather vanes. So no saving your game in dungeons. There’s not even a quick save function! This is a huge portable game sin and I can’t believe that this was overlooked. It also likes to frequently remind you after saving that you should take a break, which is a bit of a nuisance. I’m an adult, Nintendo. I’ll play as long as I want! 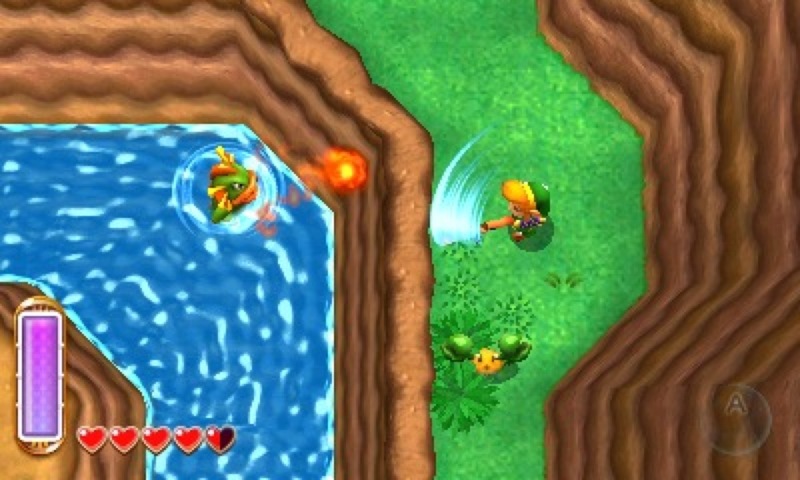 The defining characteristic of A Link Between Worlds is the ability for Link to meld with the walls and walk along them to navigate the world. It’s easy to forget that you have the ability at first, but soon it becomes the go to skill in your repertoire to figure out where to go next. It can be used to slip between narrow cracks in the wall, cross over pits, and sometimes dodge attacks (you are basically indestructible while in the wall). 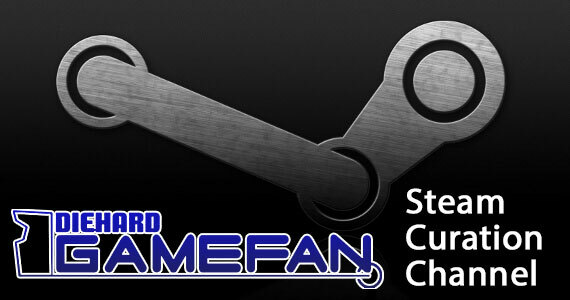 Your stamina dictates how long you can stay in this form as well as how much any of your items can be used. So rather than having to keep track of an arrow count or a bomb count, everything relies on your stamina. Speaking of items, the management system introduced ensures that the majority of the game is completely non-linear. In the past, there was a relative order that dungeons had to be tackled because you always needed particular items to progress. While it is still true that certain items are required for certain dungeons, almost all of them are available to you right from the beginning. A character named Ravio will set up shop in your house and rent out items to you for a fee. So in theory, you can rent every item he has right from the get go if you wanted. But there’s a catch. If you happen to die out in the field, his winged companion will swoop in and scoop up any items that you have rented out. While this does sound like a pain, it ensures that you only take what’s necessary for the task at hand. Eventually, you can outright purchase any of the items, and despite how expensive it is to do, will save you some trips when you start encountering the more difficult areas. Many of the enemies and bosses you do battle with are throwbacks to A Link to the Past. There’s a good balance of both new and familiar, and even ones that you’ve fought before will require new strategies that take advantage of this particular games mechanics. It was also nice to see that some of the newer titles’ hand-holding habits (Fi, I’m looking at you) were ditched in favor of an item that will consume play coins if you choose to have a ghost lead you through a puzzle. Accessible, but challenging is the name of the game here, and Nintendo managed to find the proper balance. There are a number of minigames and secrets beyond the core game. I encountered a chicken dodging game, a treasure hunt, and a foot race during my travels, a number of which rewarded you with pieces of heart upon victory. There’s a sidequest that involves returning all of Mother Maiamai’s children back to her and for every ten you bring back you can strengthen one of your items. Even StreetPass functionality is included, though I unfortunately didn’t get a chance to test it. 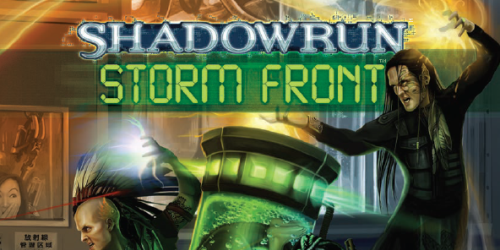 It involves having other players’ Links invade your game as a Shadow Link and a bounty can be won for slaying them. And like other Zelda titles being released as of late, you get to look forward to a Hero mode after finishing the game that ramps up the difficulty. At the end of the day, not only is A Link Between Worlds a worthy followup to A Link to the Past, it’s also the best Zelda game to be released in years. It’s most certainly the best portable installment behind Link’s Awakening, but I’d also put it above a number of the console releases too, such as Skyward Sword. The bottom line: if you’re a Zelda fan at all, you’re doing yourself a disservice by not picking this up right away. 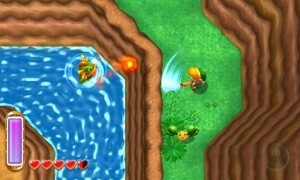 The Legend of Zelda: A Link Between Worlds is the successor to 1992’s SNES release of A Link to the Past. It brings with it familiar sights and sounds, but still manages to work a number of secrets and surprises into both the plot and the game’s world. This title makes the best use of the system’s 3D technology as well as introduces the most non-linear design since the very first Zelda game. The new merge mechanic that turns Link into a poorly drawn painting is a welcome addition and factors very heavily into the design. I hate to say that I doubted that this title would measure up to the legacy left by its predecessor, but I’m happy that it exceeded my expectations. Go buy it. In re-reading this (I beat it last night), I’m surprised you called it “accessible but challenging.” Accessible I agree with, but I didn’t think the game was hard at all. I only had a bit of trouble with one boss and I died twice the entire game (once because I forgot that potions don’t work automatically like fairies do, and one time that I don’t even remember). Collecting the Maiamai babies were easy, with the exception of finding That Last One, etc. I didn’t really struggle at all, but then again I haven’t really felt challenged during any title in the series since probably Majora’s Mask, maybe Ages/Seasons. I LOVED being able to do any dungeon I wanted. If I remember correctly, I think I did Thieves’ Hideout > Swamp Palace > Skull Woods > Turtle Rock > Desert Palace > Dark Palace > Ice Ruins, though you can actually, like you say, do them in whatever order you want, and that’s really cool. I know I spent at least an hour just wandering around, finding the portals between worlds and doing the treasure hunting dungeons. Yeah, I don’t think any Zelda games are all that hard beyond the NES era in terms of combat (I think I only died twice also). 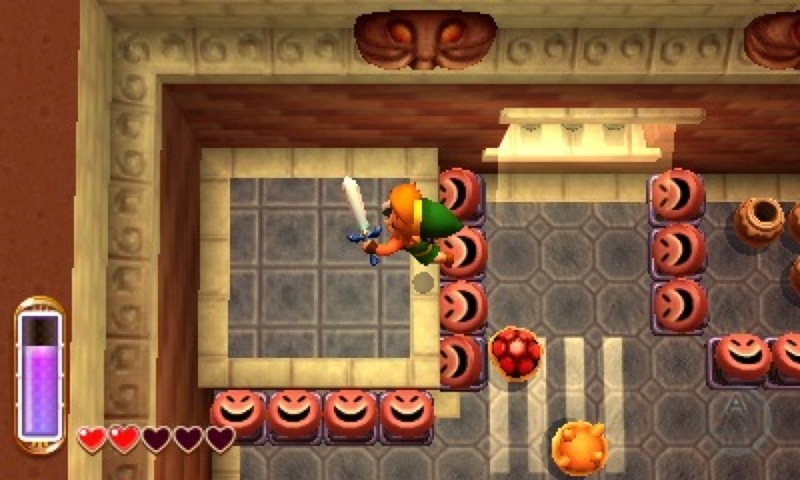 I was more referring to some of the puzzles as despite the jumping into the wall mechanic being the go to tool in Link’s arsenal, there were some solutions I had to really sit and think about, namely when it came to hard to reach treasure chests. I eventually figured them out, obviously, but Skyward Sword was a walk in the park by comparison. Probably because of that damn Fi pointing everything out to me. Oh okay that’s fair. No the puzzles were good. It felt pretty awesome to get the solution to a few of them.